Now that Sri is all the way done I can pick up some of the other projects that I let fall to the wayside. I want to finish a lot of the projects I started, but for one reason or another put away to do something else. Sweaters, socks, shawls, scarfs, and much more are just sitting there pateintly for the day that I pull them out of their wooly slumber and they get to be a finished object. Its difficult though when you see new yarn that you want so bad, but you know it’s better that you refrain. But the siren song just keeps getting louder and louder, tempting you to be bad against the social pressure experiement and to add more things to be on the needles. I used some of my available yardage I will admit to that (and you will see that soon on a public excel sheet) for some Casbah, which how can you resist the base alone? Cashmere and beautiful colors that just makes your heart sing, makes you desire it more and more until you have to give in. I resisted for as long as I could, but I was goos, I put 2 skeins on hold, thought about it and went in and they were mine. I’m not sure what I want to do, one might become a 2 color brioche something and the other who knows, but they’re pretty. Right now I’m working on Ivar again, I wanted that done when I was going to be in Portland in July. Not to wear mind you but to have it done so I wouldn’t feel as bad buying another sweater quantity of Brooklyn tweed yarn. In any case I have the body knit, one sleeve done, and just the last sleeve, seams, and the collar and voila. I’ll have another finished object, then I have to decide what to pull out next. I’m thinking the sweater that I have almost a sleeve done, but still needs the other sleeve and the whole body. That would be good to finish, not sure. But I do know there are a few thing stay I need to rip out. I think it’s time to realize that I’m not going to finish them and I found something better for them to be. So little time, yet so much I want to get done. I think I better get back to it all. There is so much that I need to get done and with school my time is getting a lot more limited. But I’m going to do my best getting some knitting time in. The new year has started and people have made their new years resolutions. I don’t know about you but I feel the same ways that Jasmin from the Knit More Girls Podcast feels, resolutions are easy to break. I think that I will start with themes for new years resolutions, something that can encompass the whole year and not be limited to one thing or another. I think for me this year’s theme is going to be self improvement, which can encompass a lot of things. From when it relates to knitting it can relate to three specific things, this blog, stash, and designs. I have a bunch of designs that I have teased you all about, I know I have teased you all a lot about them. Honestly I have them either n my head, in prototyping, or I have the yarn and just need to start them. I don’t know why I don’t just get them done and out there, I think it’s just because I have to allocate a lot of time to other things that I just don’t get the opportunity to allocate enough time to get them done. Another problem is that due to the large work load that I take on with school and work there isn’t a lot of brain power left to design. However, that’s no excuse, for this year I’m going to work on getting more designs out there for you all to see and enjoy (hopefully). Right now I have one that in progress, I might have a test knitter at the ready, and then after that it’s a quick write up, chart, and publish. Besides that I have a few others that I’m not going to talk about yet. For the blog here, I know I haven’t been writing as much as I was in the beginning, that is my fault. Again it comes down to time allocation, if I don’t have time to write then nothing gets written, but at the same time if I have time to write and nothing to write about that’s another concern. I’m going to try to get as much up here as I can (not every random thought that comes into my head, but sometimes short posts). I’m working on getting a more portable environment going, along with getting the right camera set up so I can get pictures and everything done much faster. Finally the stash, what can I say that I haven’t already said about my stash. Well, I can say that the social pressure experiment did help curve my buying of yarn last year, but I kind of fell off the wagon near the end. I looked through a large portion of my stash (which only a small part is on Ravelry) and I came to the same conclusion as I did last year, I need to use what I have. So for this year I will be performing the social pressure experiment again, with similar rules. I can only buy yarn or fiber with accumulated yardage or ounces of projects that I have completed within the year of 2015. If there is a yarn or fiber that I haven’t spun before, upon completion I will receive 10% more of the completed “credit”. If any yarn or fiber is purchased and there is no “credit” to use then double of the amount (in yardage or ounces) will need to be sold/de-stashed. There are no grandfathered events, exemptions (besides buying yarn to complete a project), or any form of justifications. This is something that I just need to do, the first experiment was very helpful for me, except for the obvious falling off of the wagon. But this year will be different, this year I will make the change, this year I will knit primarily from stash. 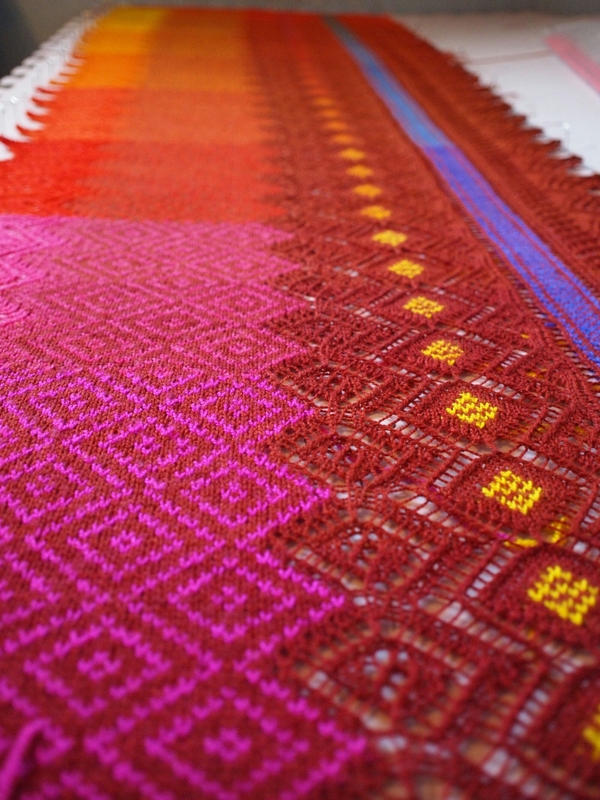 On the Sari front, I’m just zooming through the repeats, changing colors, balls of brightly colored yarn everywhere. I can’t wait for this to be done and the casual knit against isn’t casual (who was I kidding the “casual” knit against is an oxymoron). I have to try to finish this before the rest, but one has a bit of a lead on me. Gotta keep knitting like the wind. P.S. 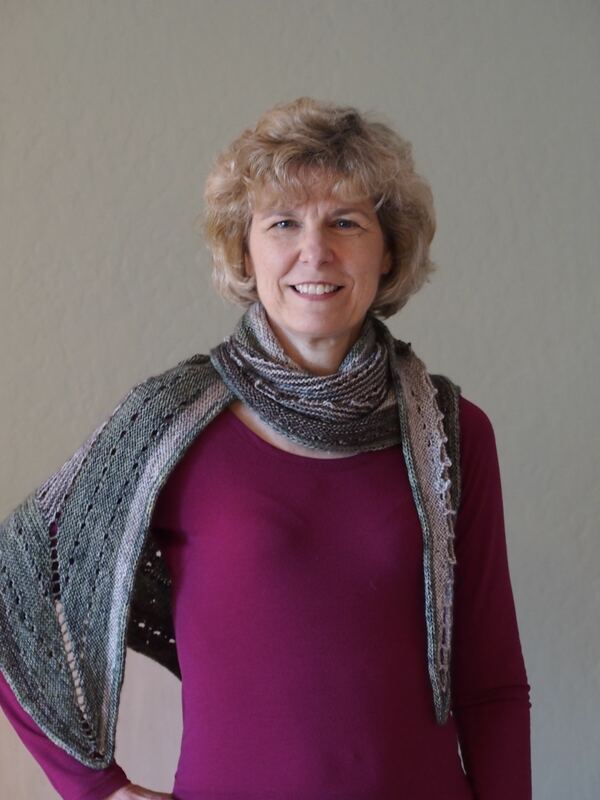 I have created a FaceBook, Twitter, and Instagram page for TygerKnits. I will let you know when I actually have everything set up and ready for you all to see. You want to talk about color? Now that my brain has had a chance to recharge and get off it’s emergency supply, I’m now able to do more knitting. Well there are a lot of things that I wanted to do but time was only one of the restraints. There is something about the ability to have your brain running on more then back up supply that just makes me feel better. 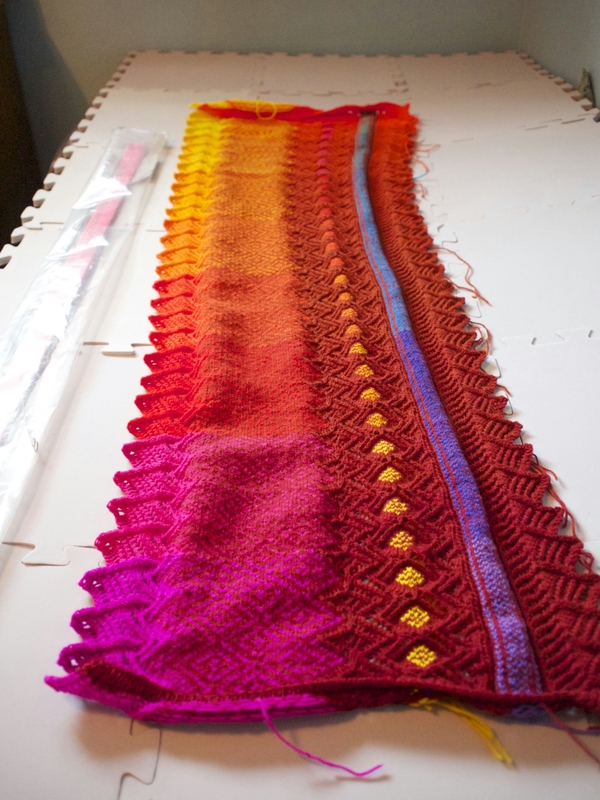 One of the next things that I’m going to start is Sari, you know that kit that I bought from Color Shift Yarn. I am so excited to start it, but not only that I have a few other things that I will be starting up in the next week or so. I have to check with the other two that bought the kits because we might get started on another knit against, which will not be as competitive, cause we want to enjoy the knitting. There is only one thing that I don’t like is that there was a lot of winding. Lots and lots of it, not that I don’t mind winding yarn, just wanted to start right away, but I knew I had to do my do diligence. Honestly I am glad that the holidays are coming to a close, even though I love the spending time with family, I don’t tlike the crazier driving, everywehere being super crowded, and the fear of leaving the house for anything. But I will say all in all it was a good holiday, when we focus on what matters, which for me is spending time with family. I did give one knitted gift this year, which went to my mom. 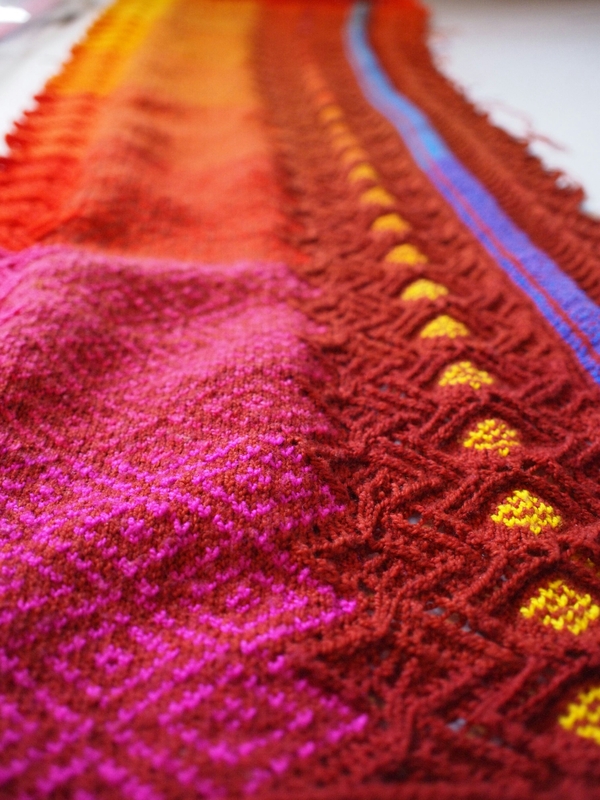 You all probably know what it is by now, in case not, it’s the color craving shawl. She saw the one last year I made for myself and she wanted it. I made her one in more of her own color palette. The yarn that I used was Madelinetosh Tosh Merino Light in Whiskers, Grey Gardens, and Whiskey Barrel. Now Sari yarn wound, needles at the ready I cast on, on this epic voyage. 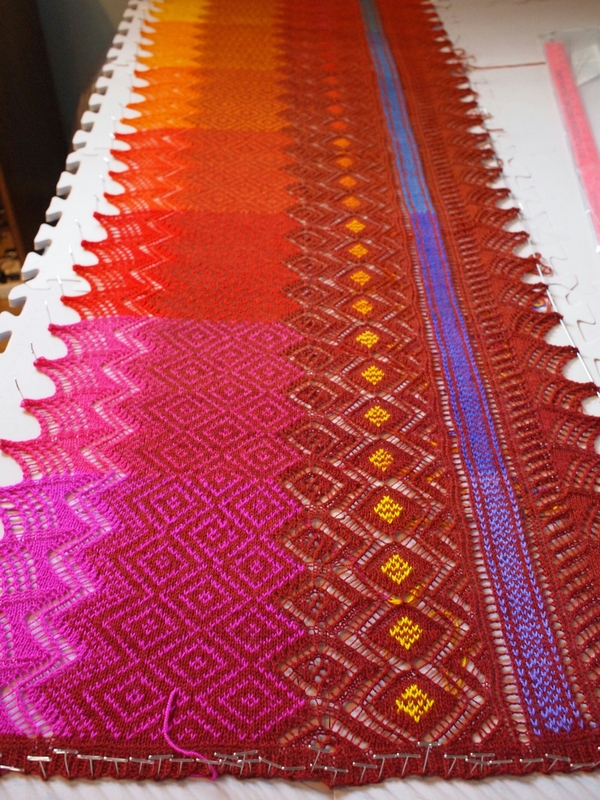 This pattern has lace, fair isle, intarsia, and lots of color changes. I’m in the groove of it, the colors make me so happy I just can’t describe. I am hoping to have this done before Stitches West. I will say you do need to get into the swing of things when doing this pattern, but once you get the hang of it, it’s becomes way more manageable. There is just one problem, you should always make sure to grab the right color. There seems to be a problem with my thining ability lately, regardeless of if I’m in my semester or not. I found that when I’m in the semester with so many classes and so little time for anything, I have to turn on the reserve power so I can get through the semester. Unfortunately I think that there is a point when I have to turn that on when it’s getting late and I’m working on a complicated project. You would think that there would be no way to mess up a clearly labeled yarn progression, making sure that you get the right colors when you need them. Well you would be for the most part correct but therer is that problem in which you aren’t fully there at that moment. I thought when I labled all of the yarn for Sari that I was out smarting the knitting fates, but that is not the case. I finished a repeat of Sari, in which I was ready for the next main color (keep in mind there are 16 or 18 main colors), so I reached into the bag ready to grab the next color, which I made sure I grabbed 2.3 (my numbering system). The next morning I was having my coffee, getting ready to start my day with knitting like I do. I thought to myself that I should probably check to make sure I grabbed everthing correctly, but I thought well I coudln’t have grabbed the wrong colors, so I started my knitting groove. 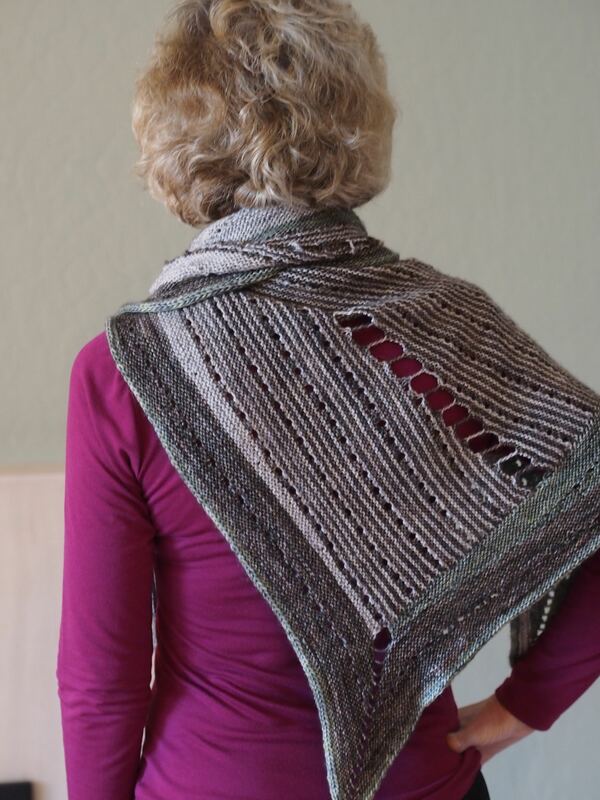 I went to knitting group and was knitting away, enabling someone else into joining knitting the Sari. I told her to make sure to label clearly and looked at my label and realized that I made a mistake, I grabbed the right number, wrong color. I grabbed copper 2.3 instead of burgundy 2.3. So I had to take out the bit that I had done, thankfully I caught before I had gotten too far into the repeat or shawl.